Rain yesterday evening, heavy around 1915 g.m.t, clearing well before midnight and then clearing skies. Dry and sunny this morning with fog filling the Derwent valley up to around 250 m.
Great start to Tuesday here, clear blue skies and light winds after earlier mist patches. Moderate rain turned light before midnight, cleared away through the early hours leaving clear spells. Turning chilly, just missing a ground frost here. Shallow fog patches forming around dawn. Sunny spells so far this morning. 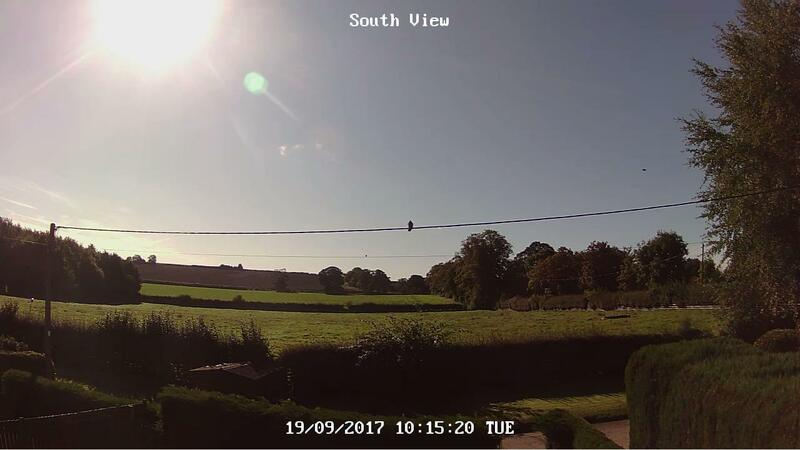 Maximum temperature to 18:00 GMT yesterday 15.2∞C. Barometer 1021.0mb: Trend: rising slowly. Clear spells, clouding over through the early hours. Rather cloudy this morning, hazy sunny spells. A few sunny spells through the morning. Turning mainly overcast by afternoon, some light rain from mid afternoon. The rain turning moderate by mid evening. Thick Fog this morning in the Valleys with sunny sky's above me giving a lovely inversion. A low of 3.2c. Dry bright and pleasant light winds and mild. A cold start much colder than forecast unless Sheffield has suddenly become rural. Sunny spells through day and quite pleasant. A dry day with long sunny periods. Dry with sunny spells all day. Dry with long sunny spells, still cool for September. Maximum 16.4, minimum 8.3. Wind light SW.